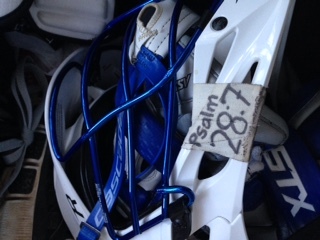 Lacrosse players are a superstitious bunch. Rules must be followed… As a mother of sons who live it and love it, I have watched with amusement many weird behaviours in them (as well as their team mates). For example, no one must ever touch the “wand” (a.k.a. lacrosse stick) unless it is the player/owner (bad “chi” will result). The proper respect and care for the wand is paramount. Don’t touch the pocket of the lacrosse head, especially when it is leaned against the wall, arched side out, while in rest (that is sacrilege). Do not enter or leave the field without your stick in hand. That is bad luck. Let no one else use your helmet. That is bad “chi.” After a game, the player must carry his bag off the field – otherwise that is bad form. In preparing for a game, for a minimum of 30 minutes before stepping on the field, one must be left to rock – that is, listen to music on earphones and focus on the game only. Otherwise, bad playing rhythm may result. One more thing, (though this is not an exhaustive list) when it is tryout season, your best team friend (and even your brother) will be given no quarter. Yup – for serious players of the game, it is nearly a religion. This morning I helped one of my guys to pack his lacrosse bag and get him out the door (on time?) for school, I noticed his helmet had a verse taped to the face mask. It grabbed my attention and sent me to my Bible. After reading the verse, I smiled. After all the “rules” of the lacrosse religion he follows, it pleases me to know the he understands the real truth of the matter – his strength and help comes from a far greater power than his own prowess. It comes from His Lord. It is this thought that sent me to writing this morn as I was convicted about following my own set of “rules.” Rules for living, rules for working, domestic house rules…rules for my faith…ouch! That one hurts the most. My rules are how I measure my own performance. Did I “do good” today? Did I exceed expectations at work, meet all my deadlines, clean the house, make the dinner, finish the laundry? Have I prayed at least twice, did I do my Bible study, have I shared the Gospel today? Oh my word, are we not all like this – following a set of internal expectations and rules to meet an external measurement of success? Whew, I am so thankful that I serve a God who will take me as I am, meet me where I am and implores me to trust Him, not my own works or my own strengths. I don’t need luck, good form, works, rhythm or chi. All I need is His grace, His love, and His salvation. Amen and Amen. 8 For it is by grace you have been saved, through faith—and this is not from yourselves, it is the gift of God— 9 not by works, so that no one can boast.10 For we are God’s handiwork, created in Christ Jesus to do good works, which God prepared in advance for us to do. Click here for a list of great scriptures about God’s Grace.